The following excerpt is a continuation in our SRW Market History Article series. For the full article, click here. Segmental Retaining Walls (SRWs) have progressed from simple landscaping wall solutions in the 1980s to one of the major types of mechanically stabilized earth (MSE) walls used in residential, commercial and transportation construction around the world. In the mid-2000s it was estimated that SRW construction exceeded 300,000,000 million ft2 (28 M m2) per year. Many walls have been built successfully to heights exceeding 70 ft (21 m) with techniques developed since the 1980s. In addition, the outstanding performance of SRWs under seismic conditions has been proven through research and actual case studies. The strong performance of SRWs and MSE walls has been demonstrated consistently in studies. Construction is considered the most critical element as the performance of SRWs is highly dependent on the quality of construction. 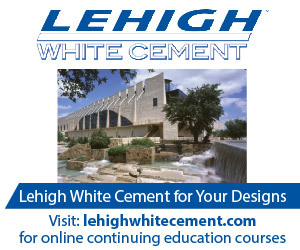 Thus, the National Concrete Masonry Association (NCMA) continuously develops resources for contractors and educates them in understanding the SRW design considerations and the importance of the recommended SRW construction practices (Ref. 17). This article is intended to discuss all the important elements and provide best practices of SRW construction from the responsibility of parties in a project, site conditions per design, and materials to construction itself. Site conditions by definitions are: A contract clause that typically requires the contractor to, at a minimum, inspect and understand the grade level and above-ground job site conditions prior to the start of any construction activities. 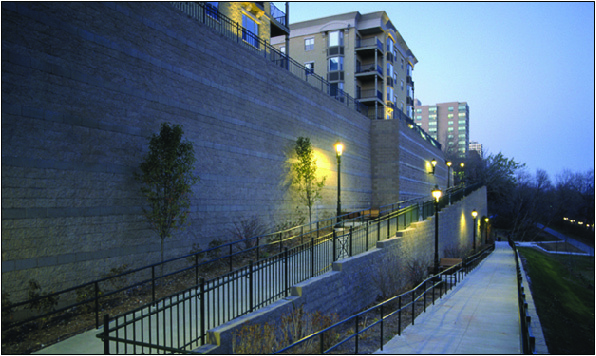 Before starting the construction process, a site review is recommended to verify that existing and proposed finish grades shown on the drawings are in agreement with the topographic information from the project grading plan, structures or utilities in the project agree with the information used for the design and are incorporated as they will affect the retaining wall. If the site conditions vary from the construction documents, then it is recommended to always notify the designer to evaluate a solution and authorize modifications. The design of the SRWs should be done by a qualified professional. In smaller walls or where building codes do not require a design by a professional, the design may be acquired from design charts provided by the SRW system supplier. The contractor should confirm the conditions on the site match the standardized design. Water is always a concern with retaining walls. A good percentage of SRW wall failures are caused by groundwater not accounted for in the design. Materials such as clays and silts in the backfill are a concern and groundwater coming from the cut in the wall area. The designers may not have been aware of these conditions during the design. If the presence of groundwater is observed in the field, then this information should be brought to the attention of the SRW designer. In this case, the designer may decide to include a chimney drain (a gravel layer installed at the back of the reinforcement area) to capture and divert the water from the reinforced zone . A normally designed SRW will not perform well with a constant source of water in the backfill. There are different solutions to deal with water in the back of the wall that are detailed in the NCMA Design Manual. A good percentage of problems in the field are caused when materials specified are switched intentionally or they change naturally and no longer meet the needed specifications during the construction process. Soil changes, by far, are some of the most common problems and can have the biggest impact in the behavior of the system. The gravel fill material is placed inside, between and behind the SRW facing units and helps with the compaction close to the SRW units, and to evacuate incidental water in that area. The recommended material for this area is a well-draining clean crushed stone. The NCMA specifications are shown in Table 1. Note the percent fines (Sieve size < No. 200) is less than 5%. The leveling pad may be constructed with the gravel fill or with a crushed stone base material depending on the drainage needs in the wall. The reinforced fill is a compacted structural fill placed behind soil-reinforced SRW units to the tail end of the reinforcement placed behind the wall. The NCMA specifications recommend backfill materials with no more than 35% fines and organic materials are not allowed. * The plasticity index of the fine fraction of the reinforced soil (PI) shall be less than 20 tested in accordance to ASTM D4318, Standard Test Methods for Liquid Limit, Plastic Limit, and Plasticity Index of Soils (Ref. 4); taller applications may require PI < 5 to 10. * Transportation specifications require no more than 15% fines and PI< 6. Authors Berg and Koerner recommend that this specification be converted to a more free draining fill to reduce the likelihood of problems in the wall. NCMA has shown that walls can be built with high fines content soil and perform well, even when they were designed to fail (the walls in the Geocomp study were designed to fail under hydrostatic load, but did not fail structurally). There was more movement in the segmental retaining wall Y than was noted in the walls with better fill materials (Wall X), but it still performed well. When fine grained soils are used, drainage and compaction must be addressed specifically. The use of clay fines should be avoided. Due to the nature of the SRW systems, compaction is a very important part in the construction process to increase density and soil strength, and reduce the settlement in the soil. The compaction is achieved by applying a load (energy) to the soil placed in adequate lifts. The soil strength properties are a function of density, i.e. a loose soil is weaker than a dense soil. Settlement is caused when the soil compresses under its own weight, or its own weight plus any surcharge load, to form a more dense structure. A well compacted fill soil could settle anywhere between 0.5% to 1% of its total height (i.e. a 10 ft (3 m) wall could experience 3/4 in (20 mm) to 1.5 in. (40 mm) settlement) under self-weight. A loose soil will settle much more causing serious problems that could lead to the failure of the wall. Poor compaction practices, such as the increase in the lift thickness, or not compacting at all to speed construction causes big settlements in the fill , not compacting behind the SRW units may also cause downdrag of the geogrid. 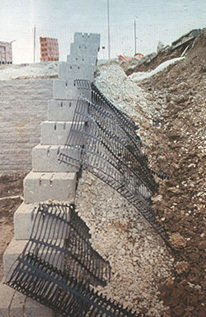 Another observed problems are the outward movement of the facing caused by the use of big equipment too close to the wall face and the development of a tension crack behind the reinforcement due to the lack of compaction in the area that ultimately will allow for damaging water to infiltrate. Compaction testing is used to verify that the soils are being placed meet the density specified. The compaction equipment used has limitations and the reader must be aware that the compaction testing only verifies the density of the soils at the surface (6 in. (150 mm) to 8 in. (200 mm)). If thicker lifts are proposed/used, the testing agency should dig down and test the bottom portion of the fill lift. NCMA does not recommend fill and compaction lifts of over 8 in. (200 mm) in any case. A good practice in soil placement is to place the first 8 in. (200 mm) lift and make about three passes with the compaction equipment over the soil. Compaction testing is performed and if the fill passes, then this procedure is used for the rest of the construction. If the test does not pass, more passes will be necessary or a thinner lift thickness until consistent, passing results are obtained. Further compaction testing during construction confirms the procedure established is valid and verifies requirements of the specification; it does not confirm the whole soil fill is placed to specification requirements. Remember that this procedure is only applicable if there are no changes in the material, equipment and moisture conditions. We have spoken about fill placement in the preceding paragraphs, but it cannot be emphasized enough for good performance. The fills should be placed in 6 in. (150 mm) to 8 in. (200 mm) lift thicknesses or less if the equipment is small. The fill should be placed from the wall face proceeding backward toward the tail of the soil reinforcement and compacted parallel to the facing from the front of the wall to the tail of the reinforcement. By placing fills in this manner the soil reinforcing is tensioned, the SRW-geogrid connection is engaged as the slack is pushed toward the tail. Compaction loading on the wall is not verified specifically by NCMA or by the transportation markets but it is indirectly addressed by specifying that “heavy compaction equipment shall not be used closer than 3 ft (1 m) from the wall.” Why? Because if large compaction equipment is used the wall face will lean forward whether it is an SRW facing, a concrete panel facing, or a rigid reinforced concrete wall; compaction forces can be large and each system has different limitations. The NCMA specifications and general construction specifications indicate the reinforcing material should be placed where specified to the front of the SRW unit to fully engage the connection between the unit and the geogrid. The specifications are also clear and the geogrid should be placed so the strength direction is into the fill zone and perpendicular to the face of the wall. The maximum spacing between geogrid layers is recommended to be 24 in. (600 mm), but never exceeding 32 in. (800 mm) for deep units, and for modular blocks that are less than or equal to 10 in. (254 mm) in depth, it is recommended that the maximum vertical spacing of the reinforcement layers be no more than twice the depth of the unit. When these recommendations are overlooked due to errors or intentional changes during construction, the wall face will move causing problems in the long run.. The design of SRWs can only be accomplished with complete wall geometry in addition to soil conditions and surcharges on the wall. The designer should be notified of any changes to the design such as wall geometry and loading conditions. For example, we often see the following items occurring in construction: 1. To save money, the wall face is kept short and a steep slope is constructed above the wall, or 2. The wall is constructed and found to be too short for what was intended, so additional face units are place to get to the desired height. Option 1 may sound like a good idea, but the reinforcing length (minimum 60% L/H) is based on a level wall condition. Increasing the slope above the wall will increase the length of the necessary reinforcing length to 80% or 100% of the wall height, so what is saved on the facing is spent on extra excavation and soil reinforcing. This also may not have been in the initial design, and thus the factors of safety no longer conform to industry standards. Option 1 has also been done where the slope angle is steeper than the internal friction angle of the backfill soils, thus the slope is unstable and may fail causing damage to the underlying retaining wall. The contractor needs to be aware of these conditions, as does the wall designers. The second option is probably seen more often where just a “few more units” will get the wall to a better height. The top units can tumble down due to the absence of reinforcement at the top of the wall. The maximum stable unreinforced height for any segmental retaining wall system is determined in the design and cannot be overlooked without consequences. Construction and techniques are harder to document and, unfortunately, construction items not well documented may present a wall that performs structurally (holds back the soil), but does not look very good. The following are some of the wall features that require special attention in the field. A partially terraced wall is a structure where the two terraces (upper and lower) come back together to form a taller wall.. A concern in this type of application is that the concrete facing units are rigid and do not compress under a load where the soil backfill will settle (i.e. 0.5% to 1% of the wall height). As the backfill settles the wall above it settles and forms a dip on the upper terrace causing cracking and opening of wall units. The wall will still perform well but may have aesthetic issues. 90-degree corners on any structure concentrate stresses that depending on the system have to be addressed. For example, in a reinforced concrete wall extra tension steel is placed across the corner to handle the stresses. SRWs have little strength for tension along the face with just a frictional connection between units. In a 90-degree corner, active earth pressure is pushing both sides of the wall out, causing tension in the corners. The result may be cracking in the corner as the wall adjusts to the new loads or the joints start to open. A solution is the use of a radius corner and using as much clean gravel behind the facing units as possible to reduce the loads. Another solution in a 90-degree corner is for the contractor to cut each unit at 45 degrees and glue them together for a 90-degree corner. While not the ideal option, the earth pressures will push the units apart leaving an open gap in the corner. Most SRW products have special units for 90- degree corners. A terraced wall is where one wall sits above and back from a lower wall. When the setback of the upper wall is more than twice the height of the lower wall (the lower wall must be the tallest), the internal design of the lower wall is not affected by the upper wall and they are both considered independent structures. Unfortunately, to get around the code requirements for design (walls taller than 4 ft (1.2 m) some contractors install two 4 ft (1.2 m) walls, one above the other with a small distance between the tiers. Each wall, designed as an independent 4 ft (1.2 m) wall. As a result, the load from the upper wall loads the area behind the lower wall causing a sliding failure on the lower wall, or a global failure. 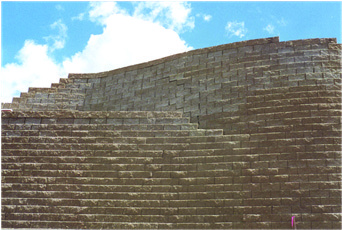 For a terraced wall design, a global stability analysis is required. The length of geogrids in the lower wall can easily be at least 70% of the TOTAL wall height. Only a global stability analysis can confirm the final design. NCMA recommends that for tiered walls closer than 2 times the height of the lower wall the system be engineered and a global stability analysis be done (see TEK 18-11B). The main problems seen in the field are due to the lack of appropriate analysis causing the projects to fail because they never detected and addressed a global stability problem. In global stability failures, it is not uncommon to see the soil around the wall move in a circular failure, keeping the SRW as a coherent mass. Examples of problems regularly ignored are weak foundation soils, steep top and toe slopes, high loads, and tiered walls. 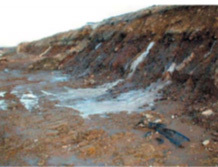 The global factor of safety of an SRW is a function of: the soil characteristics, groundwater table location, site geometry (i.e., sloping toe or crest, tiered walls), and the length, strength and vertical location of soil reinforcement (geosynthetic). The effects of each of these factors will greatly influence the final design and should be analyzed with the necessary care. For more information on the subject reader is directed NCMA TEK 15-4B, Global Stability of Segmental Retaining Walls (Ref. 25). 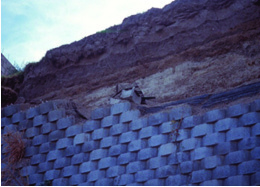 Compound failures are special cases of global stability and occur when a slip plane cuts through the retained soil, the reinforced mass, and through the face of the wall. Increased grid lengths, closer grid spacing, higher strength grids, and/or higher strength soils in the reinforced mass all increase the resistance of a potential slip plane to develop and thereby increase the factor of safety to prevent failures of this kind. In summary, the most common issues overlooked in the design and constructions of SRWs were discussed. It is the intention of this reference to help the reader to avoid these common mistakes and help with the successful installation of SRWs. The success in the construction starts with the appropriate design, the selection of good quality materials and the appropriate attention to detail in the installation process. Design heights, grid lengths, spacing and site condition should meet the designed conditions; if they do not then the designer should be notified. Materials should meet the project specifications and industry recommendations. Compaction of all the soils must be done carefully and thoroughly to ensure the behavior of the soil. Details such as corners and curves should use as much gravel as possible and be compacted carefully, partially tiered walls should be carefully constructed and terraced walls should be built to meet specifications after a careful design if the walls are closer than two times the height of the lower wall (2xH1). 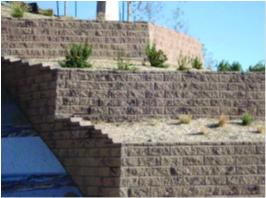 There are thousands of segmental retaining walls constructed around the world performing well. 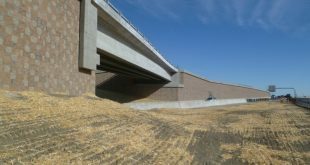 AASHTO has acknowledged that MSE walls (SRW is one example of this type of walls) are very stable in seismic conditions; FHWA is building bridge abutment walls with SRWs and mining companies are using them for truck loading ramps. This still doesn’t consider the millions of square feet (sm) of wall built for residential and commercial applications that are installed annually with exceptional results. NCMA and the industry are working hard to educate the contractors and designers in good practices and to understand design and performance.